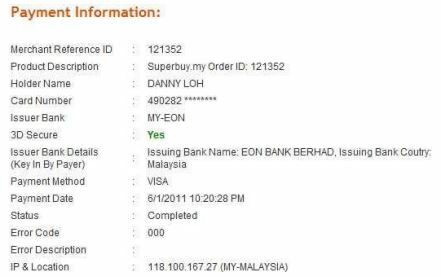 To set up your NetPay account, firstly go to www.netpay.my. 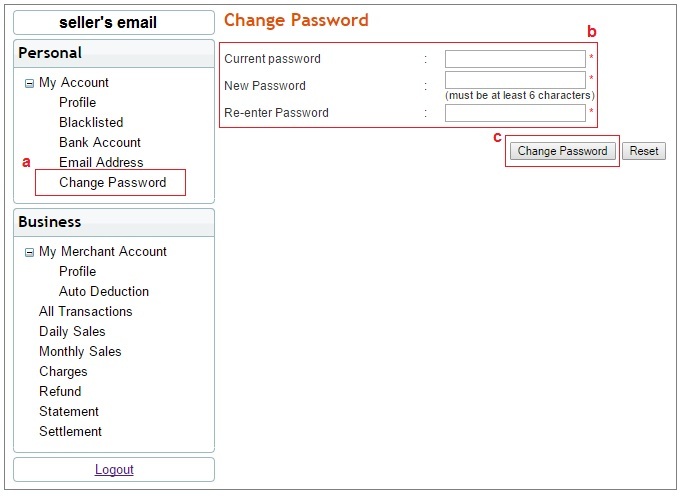 Login into your account with your email address and password at the Login Panel. 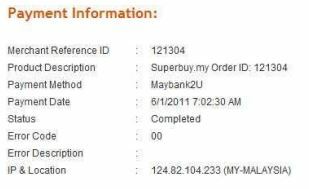 For 1st time login, your email will be your Lelong.my registered email and password. After you have logged in, please change your password. * It is compulsory to change your password the 1st time you login into your NetPay account. This is for security purposes. **After changing the password, you can start setting up your NetPay account to your own preferences. Under your account, there are few functions for you to use. The account is divided into 2 sections, Personal and Business section. Change Password – to change password. 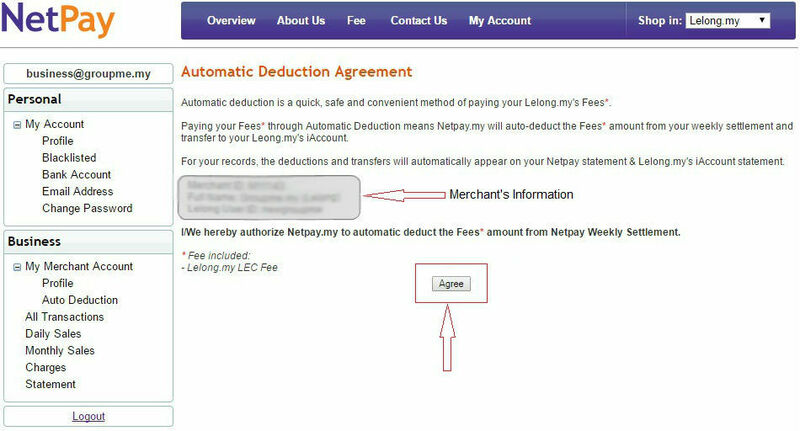 Auto-deduction – to request auto-deduction for Lelong Transaction Fee from your settlement. Step 2: Read Terms & Condition. Then click “Agree”. Merchants can view all of their NetPay reports here. 1.Click “All Transactions” under Business section. 2.Select your search preference according to the Date, Merchant, Reference ID, Buyer Email, Payment Method or Status and click “Search”. 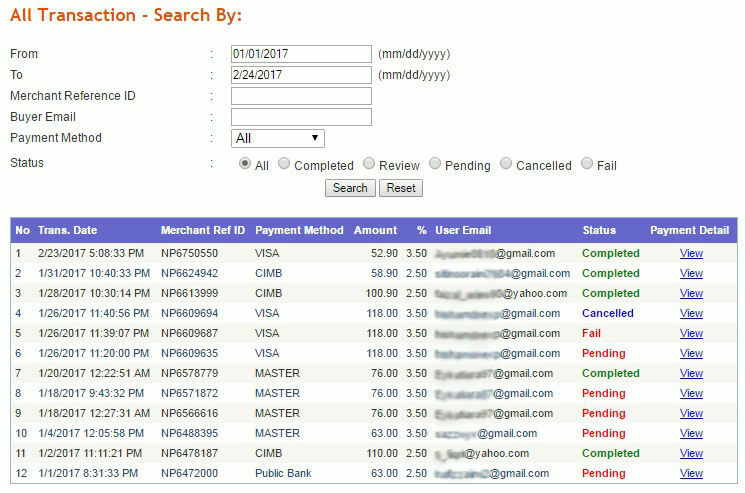 3.The payment transaction report will be generated for you. Pending: Buyer not complete payment process. Buyer Email: Your buyer’s email address. As part of risk management, we would like to protect our valuable seller from fraud and unauthorized card holder transaction while for against the chargeback with review the payment for verification purpose. At the same time, this process could help the seller from loses due to fraud and chargeback. 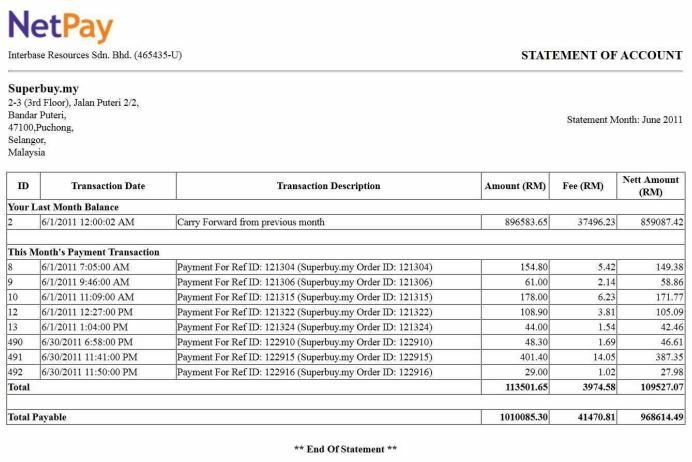 Please be informed, this payment review process only will take place when it’s suspected and also when the amount more than RM3000. 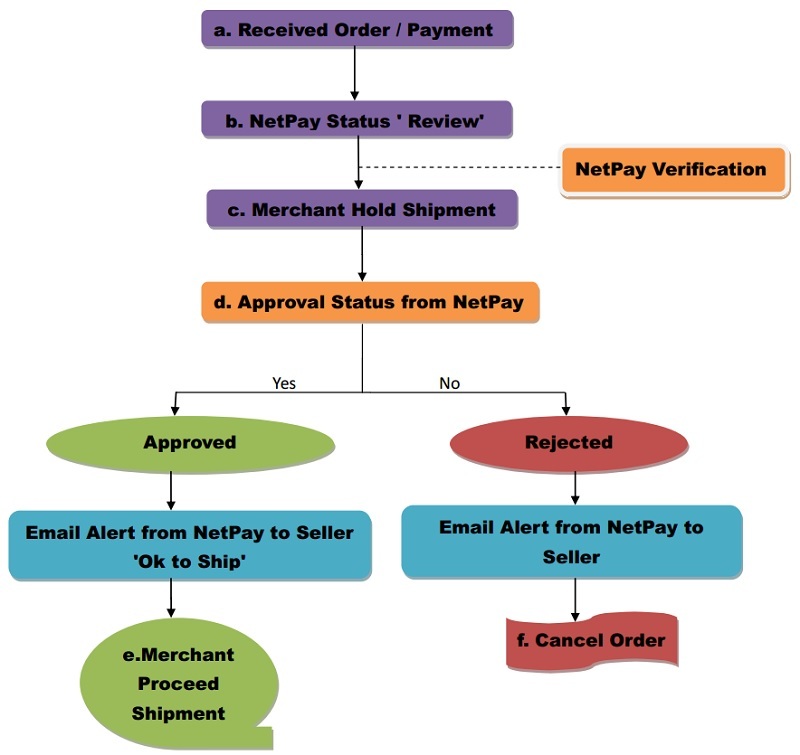 NetPay will review the past payment history of buyer and will make sure the buyer is contactable for verification. This process will be done within 3 working days. 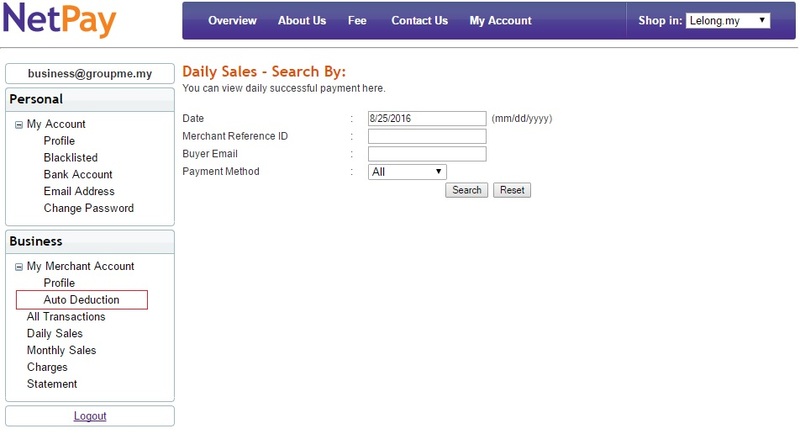 You can view daily and monthly sales report. This report is only for Successful payment only. Select your search preference according to the Date, Merchant, Reference ID, Buyer Email, Payment Method or Status and click “Search”. The payment transaction report will be generated for you. 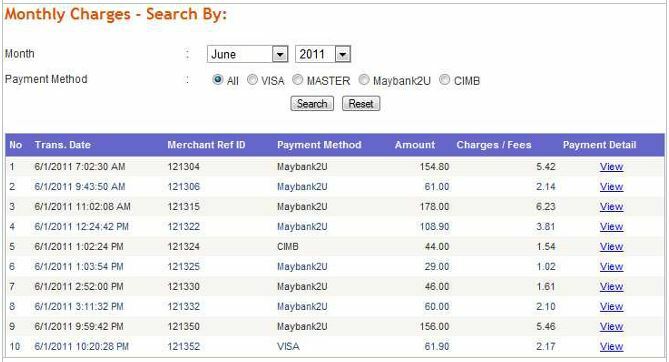 You can view all monthly transaction charges. You can view all statements.